First successful cloning of monkeys. Using the same techniques that produced Dolly the sheep two decades ago, Chinese scientists have cloned long-tailed (cynomolgus) macaques — named Zhong Zhong and Hua Hua. This finding is not only another step towards cloning humans (although under present day ethical standards unlikely to occur), but may also help medical research interested in studying genetically uniform monkeys. This is truly the first instance of cloned monkeys. Researchers have been attempting for several decades and many believed the feat was impossible. Thus, further clones are necessary to validate this first instance. CRISPR turns skin cells to stem cells. Pluripotent stem cells can develop into virtually any cell type in the body. They are a key therapeutic resource for heart failure, Parkinson’s, and even blindness. Now researchers at Gladstone Institutes have turned mouse skin cells into these pluripotent stem cells by using CRISPR This finding provides a new way for scientists to make stem cells for research on targeted therapies. Future research will examine how exactly CRISPR is able to reprogram the skin cells, and if this technique can be used on other types of cells. This research was published in the journal Cell Stem Cell. 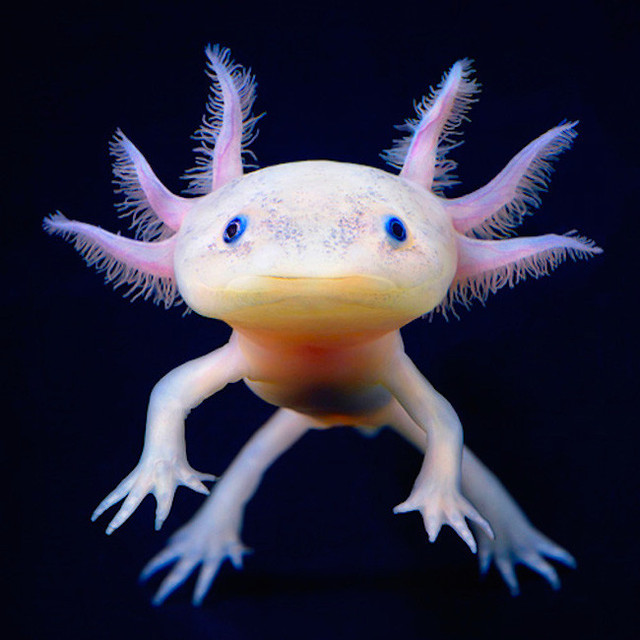 Axolotl genome decoded for regenerative medicine. The Axolotl is a salamander native to Mexico and is a powerful tool for regenerative medicine. For the past 150+ years, scientists have studied the axolotl’s remarkable ability to regenerate limbs, bones, muscles, nerves, spinal cord, retinal tissue, and brain tissue. This week an international team of researchers have now sequenced, assembled, annotated, and analyzed the complete axolotl genome, which is the largest genome ever to be decoded. This decoded genome will provide scientists with a map to better understand the molecular underpinnings of regeneration in the axolotl. This research was published in the journal Nature. Could chronic wasting disease jump to humans? Chronic wasting disease, has so far, been found only in members of the deer family, and is fatal. It is caused by a prion, and even though it is primarily found in the central nervous system (brain and spinal cord) it can spread to the peripheral nervous system (e.g., to the meat and muscle of the deer). To understand whether consumption of deer meat could be passed to humans, researchers at the Canadian Food Inspection Agency, exposed 18 macaques to CWD in a variety of ways: through contact with skin; by feeding them infected meat; and intravenously. To date, 3 out 5 macaques fed deer meat have developed CWD. While these data are tentative, and still not peer-reviewed, a preliminary conclusion is that CWD may well be capable of passing to humans. This is supported by the fact that prion diseases which affect humans also affect macaques. The Health Products and Food Branch of Health Canada has issued an advisory to this end. How ultrasound, microbubbles and animal research are being used to treat diseases. Many neurological diseases are difficult to treat because the blood brain barrier (BBB) prevents drugs from directly reaching the brain. However, if you place microbubbles at this barrier and hit them with ultrasound, they begin to oscillate and grow — until they reach the size of about 8 microns. Then, like magic, the BBB pops open, for a few hours which permits for drugs in the blood stream to slip in. However, this process is tricky, for if the bubbles burst, they can irreversibly damage the BBB. A researcher in China, Tao Sun, found a way using ultrasound, to listen to the bubbles, and identify the sweet spot when they wouldn’t burst and validated the method using rats and mice. This method has also advanced our thinking about treatments for inflammatory bowel diseases and cancer. Posted on January 26, 2018 January 26, 2018 by EditorPosted in News, Research RoundupTagged cancer, chronic wasting disease, clone, CRISPR, cynomolgus, Inflammatory bowel disease, long tailed macaque, microbubbles, Parkinson's Disease, ultrasound. Previous Previous post: 2018: The Year the Readers Started Writing?